How an assessment framework and toolkit benefit staff and the organisation. In 2017 NHS Wales developed a new All Wales Recognition of Prior Learning (RPL) Framework and Toolkit via the Workforce, Education and Development Services (WEDS), to address recommendations made in a Report to Welsh Government on the implementation of the NHS Wales Skills & Career Development Framework for Clinical Healthcare Support Workers supporting Nursing and other Allied Health Professionals. 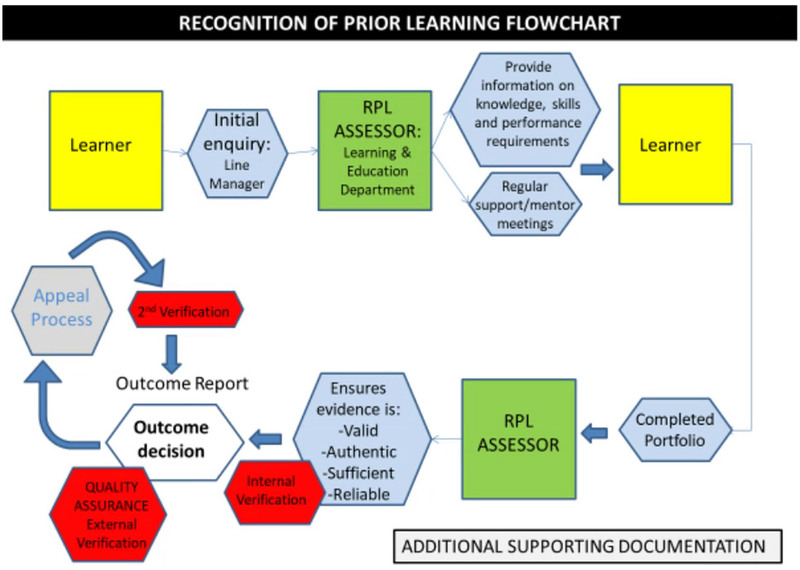 This framework enables evidence of previous learning and experience that is relevant to the employee’s post to be verified and minimises the need to duplicate learning. It is designed to support progression and staff development through lifelong learning, non-accredited in-house learning or work-based learning qualifications which are no longer current. It also makes provision for the acknowledgement of relevant learning through experiences. It helps ensure consistency of approach in the execution of the RPL process across the NHS in Wales. RPL is a process which enables recognition of formal and informal learning and award/transfer of credit towards existing courses or units of learning. It is defined as a method of assessment that considers whether a learner can demonstrate that they can meet the assessment requirements for learning through knowledge, understanding or skills they possess and that they do not need to go through a course of study. It is one method of enabling individuals to claim credit irrespective of where the relevant learning has taken place in the past. In the context of CQFW, the definition of RPL is specific and relates to assessment leading to the award of credit. Assessment for RPL is conducted against learning outcomes and assessment criteria of a unit and is subject to the same internal and external requirements as any other kind of assessment within the CQFW. The Framework documentation provides support and guidance for supervisors, managers, learning and development staff, assessors and learners on the implementation of an All Wales RPL Framework for NHS staff in Wales to acknowledge prior learning, experience and qualifications required to undertake current roles in Wales. It fits with the One Wales ethic and embraces the NHS core principles, developed to help, support and value NHS Wales staff. The principles are rooted in the prudent healthcare concept. Learners/employees will need to present evidence in a way that demonstrates that learning has taken place. The RPL Portfolio provides guidance and tools to support the collation and presentation of this evidence. Assessors must determine that evidence used for RPL is valid and authentic and in accordance with the relevant awarding bodies’ criteria. When the learner wishes to claim RPL they will require the support of current or previous managers or RPL Advisor. The whole process must be carried out by staff with relevant expertise and knowledge to meet the requirements of delivery and assessment for the qualification they are working with. Internal and external verification must be in place to confirm the process of RPL and any proposed award of credit/recognition. In some circumstances, there may be a limit on the proportion of a qualification that can be achieved by credit transfer or RPL. The All Wales RPL Framework and Toolkit is seen as an important development towards recognising prior learning and experience of NHS Wales employees. NHS Wales values its staff and wants to recognise competence relevant to an individual’s role no matter how it is achieved, including on the job learning and learning gained outside of a formal setting. But knowing how to go about recognising and acknowledging such learning and experience is a challenge. This RPL Framework and Toolkit offers step by step guidance and support to all those involved, from start to finish in a standardised way. Two new recruits to Public Health Wales Screening Services have just embarked on the RPL process. We have just been recruited to screening posts with Public Health Wales. We both have a Level 3 qualification - QCF in Health and Social Care Level 3 – but for our new posts need to have the Diploma in Health Screening. The RPL process will work for us. It will significantly reduce the amount of work we have to undertake to complete and successfully achieve the Diploma in Health Screening. This also means that we shall be competent to screen a lot more quickly and that there is a reduced assessment burden on the clinical skills trainers and Internal Verification staff.